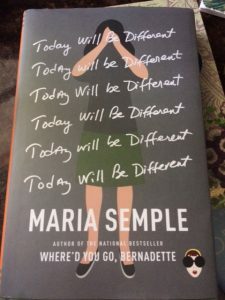 Maria Semple did it again! She treated her readers to a fabulous read with her “Where’d You Go, Bernadette!” Her new book does not disappoint! “Today will Be Different” takes us on an adventure along with Eleanor..as she goes about her NORMAL day! Eleanor is a riot and we can’t help but to love her. As a person passionate about reading, I came to the conclusion that I should not keep the joys of reading to myself…thus the creation of my BOOK TALK blog/website and video segments. I share various books I have come across so that others may discover books they may not have ever come across themselves. Some books will be best sellers, current and others may be random finds…treasure…definitely to the eyes and heart of this reader. But maybe a book that others will treasure as well.